We are the foremost suppliers in Worthing and Sussex for soft, long-lasting, top-quality and UK award winning Cormar Carpets. We stock a terrific range of Cormar’s plain and heather wool twist pile carpets, textured loop pile carpets and easy-clean polypropylene carpets which are all manufactured on site at their two Lancashire mills. 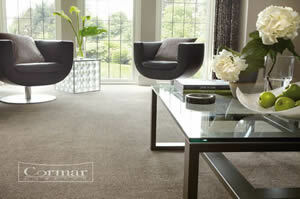 Cormar Carpets use only the best quality yarns in either 100% pure new wool, 80% wool-blends or easy-clean polypropylene. There is no better combination of quality, value and choice. Ranges are updated on a continuous basis to ensure that the colours and styles remain in tune with current home furnishing styles. 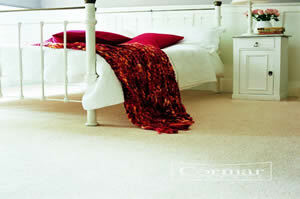 Suitable for most areas throughout the home as bedroom carpet, lounge carpet or stair carpet. They are produced in various pile weights and a wear suitability rating is provided on all carpet samples. A good quality new underlay will also maximise the durability of your chosen style. Members of the Carpet Foundation the manufacturer offers a 2 year guarantee against manufacturing fault and pile reversal guarantee, which is approved by the Trading Standards Institute. You are in good company as over 1 million people choose Cormar Carpets every year. Choose your Cormar Carpets in Sussex with Burgess Flooring and Blinds. Book an estimate today! Just click on the links to find out more about our skills and what additional products we offer our Sussex Cormar Carpets customers.